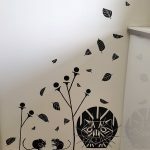 I usually hang pictures on my walls, but thought it would be interesting to explore how to make mural art. As a designer and illustrator, I usually do all my drawings and sketching in notebooks or on plain A4 paper. So, I am used to relatively small illustrations. 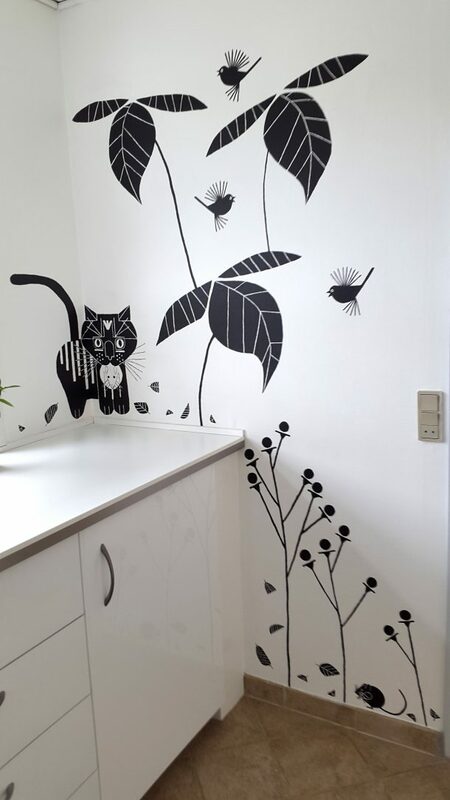 The idea and the desire to try out artwork in a larger scale occurred when I renovated my utility room. A room with white walls and white cupboard elements. I wanted to challenge myself by creating big size illustrations that would fit the space of my utility room. The next task was to decide on the theme for my design. I spent some time looking at mural art, especially on Pinterest, here you can find the most amazing examples for inspiration. Since it was my first attempt (but certainly not my last), I chose to use only black paint for my motifs. Apart from my family, we also have two cats, who lives in the house. They chase and catches both mice, insects, frogs, which is good, but unfortunately also birds, which I am not so happy about. Fortunately, my cats like to come in and show me their catch for the night, while its still alive, and that has saved many birds lives. And it occurred to me, that of course I should illustrate cats, birds and mice in a plant thickets. Although the idea was motives in large scale, I started to make sketches in notebooks, as I usually do. 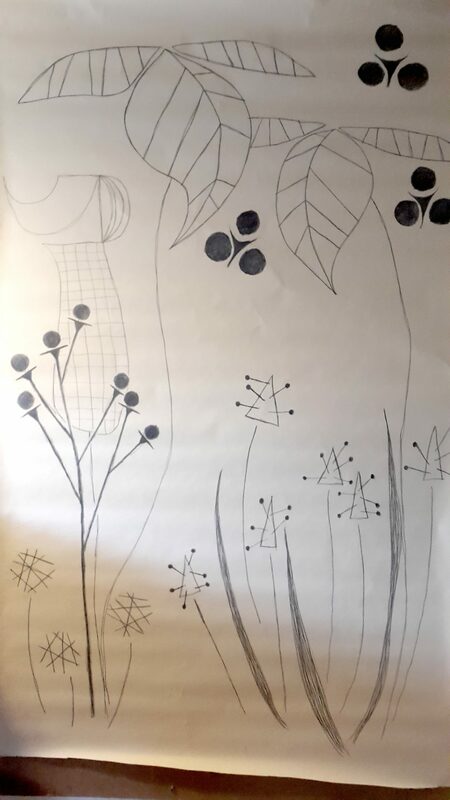 After examination of the sketches I chose some of them and I drew them in large scale on large pieces of paper, to see how they worked in this scale. I cut the individual motifs and taped them up on the wall to find out the composition of the wall. By cutting the various motifs I could move them around as desired and add and remove until I was satisfied with the composition. Then I drew the motives on stencils paper so I could transfer the motifs on to the wall. 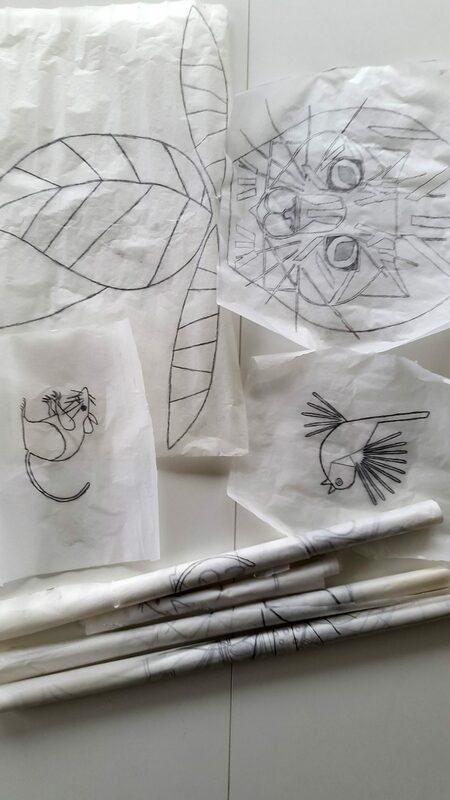 I felt I needed some light pencil drawings, to support me when painting the motifs that should be permanently stay on the wall. To be quite sure whether I did the right thing, I tried searching for tutorials that could show me how to prepare the walls for mural art. I did not really find anything, other than just do it. Well – if it all comes out wrong, you can just paint the wall white again. I therefore got some paint samples from the store: a glossy black and matte black, to compare how they would work on the wall. I made two test images and held the glossy and matt pictures against the wall. I chose the matte because the glossy paint gave too much glare when light fell on the motifs. And after all these preparations – I finally began to paint. I learned that it took much longer than I expected. But, with a little patience and plenty of good music, it was almost a meditative act. 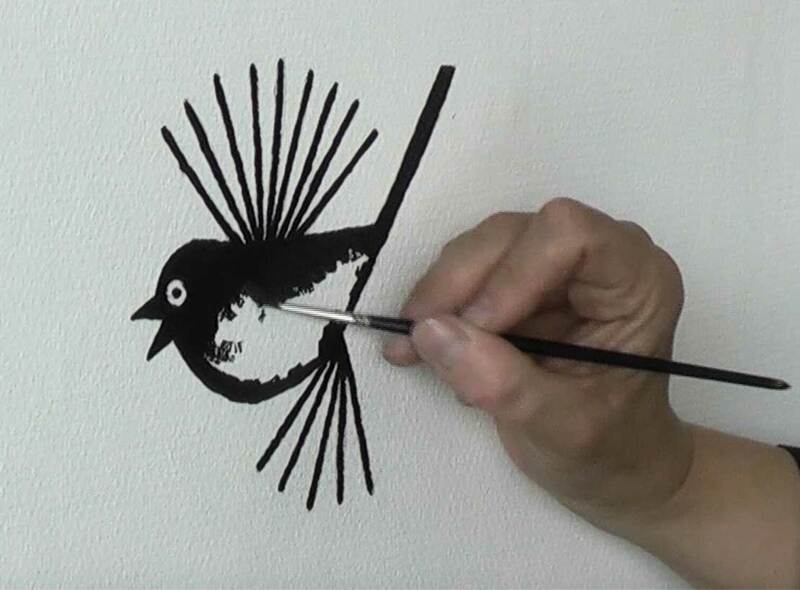 The video shows quite well the slow process, it is to paint a single motif as accurately as possible on a wall. PixelPencil Mural Art from Kirsten Mikkelsen. The music for the video is created by nullrate. Filed under Design, How To's, Video.